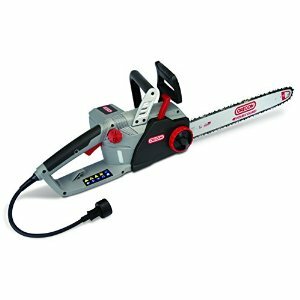 The CS1500 Oregon electric chainsaw has all the classic features of an electric chainsaw- low noise, minimal maintenance, silent between cuts, and an inbuilt chain sharpening system. By just pulling the red PowerSharp lever, your chain will transition from dull to sharp in a matter of seconds. The saw is well made, with a design that can easily be cleaned under the side cover. The OREGON CS1500 electric chainsaw review below shows that this saw is manlier than the newer battery saws that you might have tried. Just like most chainsaws in this bracket, you cannot use the OREGON CS1500 to perform heavy-duty tasks. Gas powered chainsaws are excellent for this kind of work. What can you say about the performance of the OREGON CS1500?The 15 Amps power makes the OREGON CS1500 a tool for undemanding yard work only. Compared to a gas chainsaw, this saw is good for hedge trimming, cutting logs, and cutting tree branches. Ideally, the OREGON CS1500 will get everything right as long as it is being used for its intended tasks. What are the safety features of the OREGON CS1500? The OREGON CS1500 has pretty everything that a real chainsaw should have. The guide bar has plastic safety teeth that reduce the possibility of a kickback. The saw also has rear and front hand guards together with an integrated chain break. What sets the OREGON CS1500 apart from other chain saws in the same category? The OREGON CS1500 is the only good electric chainsaw in this category that enjoys the auto-sharpening feature. You do not have to sharpen the chain individually; it sharpens itself. This means that you can work more efficiently and for a long time without needing a break. The CS1500 has garnered 4.2 stars out of the possible five stars, after 122 customer reviews on Amazon. The positive reviews mostly touch on its lightweight and quieter nature. The negative reviewers, on the other hand, complained about the durability of the chain. What are some of the safety precautions that one should take when using the CS1500? It is always advisable to wear protective gloves when handling chainsaws and the CS1500 is not an exception to the rule. Also, wear clothes that are sturdy but lightweight enough not to be a burden to your work. Many electric chain saws have gathered a bad reputation from low powered, cheap versions sold at various stores. It is, however, important to note that there is a huge difference in quality and power among the different models. The OREGON CS1500 is among the most powerful chainsaws when compared to different 12 and 13 amp chainsaws. It is sturdy, smooth, and well balanced. More important are its electric chain brakes that stop the chain instantly when the trigger is discharged.